Illawarra Medical Centre, Ballajura, WA. 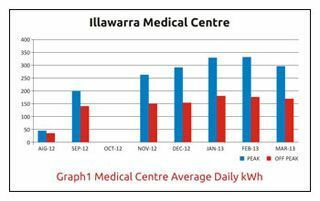 Illawarra Medical Centre is one of the biggest medical centres operating for more than 20 years in Ballajura, approximately 12 km from the Perth CBD. The medical centre has a strong focus on training General Practitioners, Medical Students and Nurses for the future and are involved in numerous research projects aimed at increasing the support and care of the patients. The medical centre is spread over two buildings, the Medical Centre and the Pathology Building. An energy reduction review conducted by Regen Power revealed that the average consumption of electricity is about 450 kWh/day for the medical centre building and 180 kWh/day for the pathology building. The medical centre had a peak electricity tariff of 39c/kWh (ex GST) while the pathology building had a tariff of 31c/kWh (ex GST). The Director of the medical centre, Dr Alan Leeb, wanted to offset as much of the Medical Centre's electricity costs as possible while making a positive contribution to the environment by generating green electricity. Regen Power designed a 50 kW solar power system to meet the day time electricity demand which is mostly lighting, refrigeration and air-conditioning. The system is the largest such roof top solar installation for a medical centre in Western Australia. 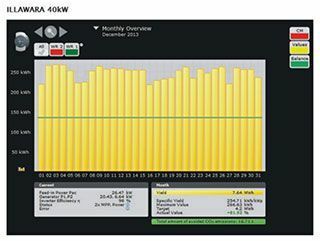 The engineers at Regen Power collected average radiation, air temperature and other climate data throughout the year prevalent in that particular area to determine the appropriate system design for the required 50kW solar power. The system consists of 200 numbers of Hanwha SolarOne Polycrystalline 250W solar modules. The modules are supported by a 25-year warranty and are certified by TUV, CE, UL and CEC worldwide certifications; along with meeting all Australian and European quality and safety standards. Three numbers of SMA Tripower inverters (2* STP 15000 TL + 1* STP 10000 TL) which offers exceptionally high yields with an efficiency of 98.5% and are supported by 5 years warranty. Like all Regen commercial installations, the system also includes a remote monitoring system. 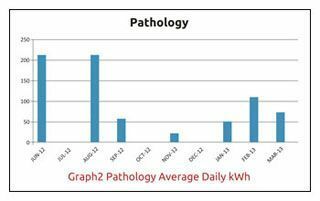 The 40kW system installed on the roof of the medical centre building generated 7640 kWh of electricity while the 10 kW system installed on the roof of the Pathology building generated 1870 kWh during the month of December 2013. 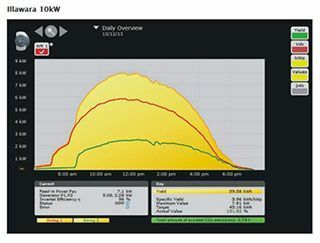 Perth's annual peak electricity demand occurs in summer during prolonged heat waves as experienced on 11 Jan 2014 when, according to the Bureau of Meteorology (BoM), the temperature reached 44 degrees Celsius in parts of Perth. 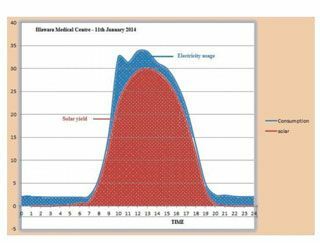 As can be seen from the data obtained, a major portion of the electricity consumption of the medical centre during the day was met by solar power. 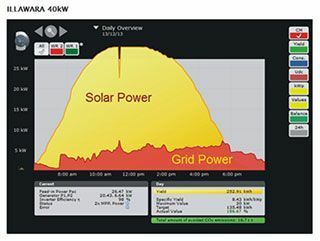 In addition, solar electricity produced between 2:00pm-5:00pm assists in bringing down the peak demand of the entire Western Power electricity grid. The solar power installation is expected to meet about 35% of the annual electricity consumption of the medical centre. This is equal to about a carbon footprint saving of 64 tonnes of CO2per annum –equivalent to eliminating the carbon footprint of 12xaverage Western Australian household's annual electricity consumption.